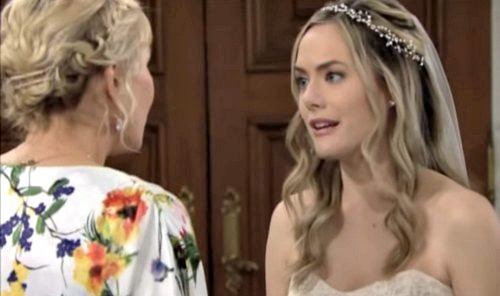 The Bold and the Beautiful spoilers tease that Liam (Scott Clifton) and Hope’s (Annika Noelle) wedding will be postponed in light of Bill’s (Don Diamont) lies being revealed. After hearing the truth about Bill’s scheme to keep Liam and Steffy (Jaqueline MacInnes Wood) apart, Lope will feel that they have no choice but to put their wedding plans on hold. Hope will probably step back and lovingly give Liam the space he needs to figure out what he wants to do. This is the type of situation in which everyone involved needs to take some time to think through what’s happened and make sure that a reasonable decision is made. Liam will want to process what he’s learned, and he’s going to have to talk with Steffy and confront Bill for his misdeeds. But not everyone is going to want to afford Liam the time he needs to work through everything that’s happened. The Bold and the Beautiful spoilers say that Brooke (Katherine Kelly Lang) will assess the situation and determine that the best thing for everyone is for Liam and Hope to still get married…and as quickly as possible! While Brooke continues to fight for Hope’s happiness and pushes for a quick Lope wedding, Ridge (Thorsten Kaye) will keep urging Liam to return to Steffy. The Bold and the Beautiful spoilers say that this will cause more friction between Ridge and Brooke going forward. “Bridge” have already been having a difficult time as a result of the Liam-Steffy-Hope triangle, but it looks like we’re going to see it go to the next level. And there’s more friction that could come from Brooke’s continued pressure for Lope to marry ASAP. Taylor (Hunter Tylo) is surely going to be furious over Brooke’s actions! When Taylor finds out that Brooke still wants Lope to marry despite Bill’s lies…watch out! We may be looking at some great summer drama as these fierce and protective mothers look out for their daughters. And if it turns out that Hope is pregnant, look for Brooke to get even more fierce as she fights for her daughter’s happiness! Will Bridge’s marriage be able to survive the actions they take to protect their respective daughters? And will we see a full-scale Brooke/Hope vs. Taylor/Steffy war this summer? Stay tuned to the CBS soap and don’t forget to check CDL often for the latest Bold and the Beautiful spoilers, updates, and news.